The top model on castors of the HSM shredstar series. 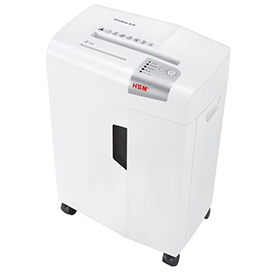 Quiet and powerful, it provides for more data security in the workplace thanks to the particle cut and also has an anti-paper jam function. It can be used by up to five people. Features of the X5 include a light barrier for automatic start / stop, automatic return eliminates paper jams, automatic detection and shutdown if the waste container is full and a level indicator through inspection window in the waste container and a noise level of 58dB.